Happy Wednesday! Counting down four days till Christmas and eleven days till New Years! SO exciting. 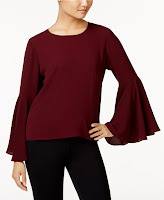 Today, I wanted to share this really cute Free People burgundy modern femme faux-leather mini skirt from Macy's. It has a slightly stretchy material and fits like a glove. 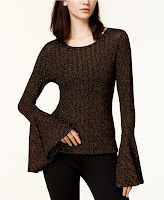 It can be worn with many different tops and shoes. It's one of those skirts that can be dressed up for a night out with heels or more casual with flats or boots for a day time look. 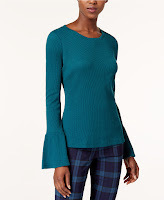 I found similar styles in different colors HERE, HERE and HERE. 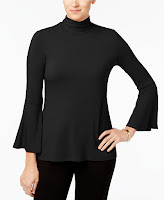 This black double layer bell sleeve mock neck top is from Macy's and is my favorite part of this outfit. Felt like I went back in time to the 70's. 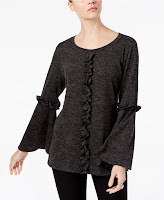 It fit my arms and neckline really well - no excess material. 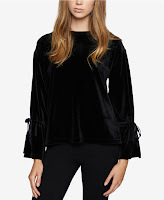 I really like the bell sleeve style, and definitely will incorporate it into future looks. 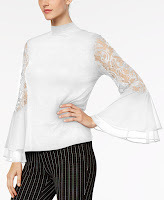 It's sold out at Macy's, but I found (too) many other bell sleeve style tops to choose from! 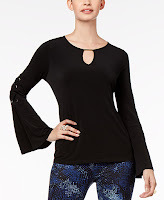 Click the images to shop! As year end is approaching, I'd like to share my favorite red lip products from 2017. There are many good red lippies out there, but others can fool you at first. The best ones are worth the purchase (some of them are so affordable, it's amazing) and the time. I've hunted for the best red shades and styles for a while now. I put many to the long wearing test. Some of them are new products, some have been on the market for years. Some I'm not crazy about and would not recommend. In my experiences, the five below are worth every little penny and minute! Everyone deserves to own a fabulous red lip for when they want to up their game. Click the links to shop! Mac Lipstick Matte - Shade Russian Red: Non-drying, creamy rich formula, won't crease, highly pigmented, intense bluish red & still looks fab after I eat pizza. I wear this one the most because it comes in a mini size, and I can easily put it in my purse for the night. L'oreal Infallible 8 Hour Pro Lip Gloss - Shade Red Fatale: High impact soft finish, very pigmented, smooth application, hydrating, did not need to use a lip liner and very comfortable to wear. Such a good affordable lipstick line at the convenience store. Smashbox Always On Matte Liquid Lipstick - Shade Bang Bang: Bright yellow red, easy to apply, long wearing, non-drying, smudge proof, and an amazing applicator. 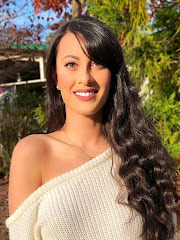 Charlotte Tilbury Hot Lips Matte Revolution Lipstick - Shade Carina's Love: A bit of a creamy texture, long wearing, non-drying and has secure gold packaging for the win. CT has one of the best lipstick formula's in my opinion. A little more pricey, but will last a long time. Fenty Beauty by Rihanna Stunna Lip Paint Longwear Fluid Lip Color - Shade Uncensored: Rihanna hit a home run with this one. It's so well done. Such a perfect red for all skin tones, lightweight, has a soft matte finish and the applicator is like a dream. Enjoy all the red lippies and let me know what you think! Leave a comment or send me a message!